For other uses, see Dyrehaven (disambiguation). Dyrehaven (Danish 'The Deer Park'), officially Jægersborg Dyrehave, is a forest park north of Copenhagen. It covers around 11 km2 (4.2 sq mi). Dyrehaven is noted for its mixture of huge, ancient oak trees and large populations of red and fallow deer. In July 2015, it was one of the three forests included in the UNESCO World Heritage Site inscribed as Par force hunting landscape in North Zealand. 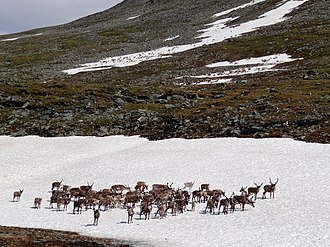 In 1669 Frederik III decided that the wood of "Boveskov" ("Beech wood") should be fenced in and wild deer from the surrounding areas driven into the newly created park. Boveskov was already well known as the former property of Valdemar the Victorious as it had been recorded in his census (the Liber Census Daniæ) of 1231. The forest lay in the westerly and southerly part of the present Dyrehaven and encompassed land used by the farmers from the village of Stokkerup, which lay to the north. Fencing work consisted of excavating a ditch, the earth from which was built up in a bank on the outside walls of the ditch, on the opposite side to the centre of the park. On the top of the bank posts were driven into the ground and fences installed. This made it more difficult for the deer to leap the fence, as the rise between the ditch and the bank effectively increased the level of the fence. The ditch and bank can still be seen for a long stretch in the south-easterly part of the current park. The work was never finished, as Frederik III died in 1670. The design, however, is still on record, and the area for the scheme worked out at around 3 square kilometres. 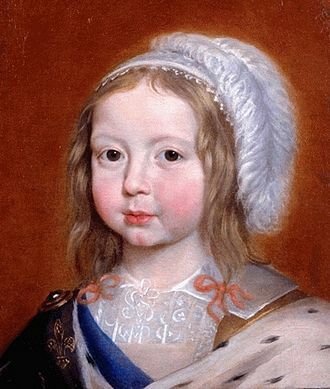 When Frederik's son, Christian V, became king, he laid out new and more ambitious plans for Dyrehaven. 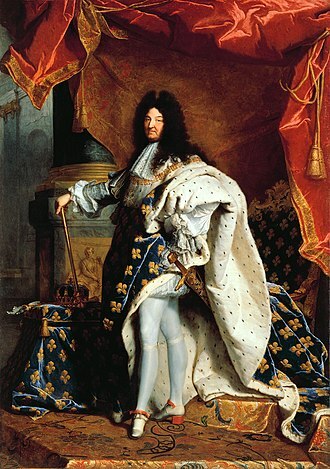 During his education Christian V had spent time at the court of Louis XIV in France. 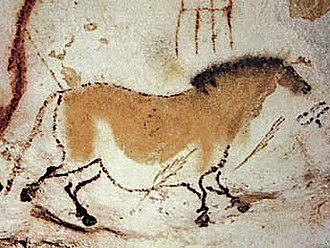 Here he had seen another type of hunting practice, parforce (hunting with dogs), that he wished to adopt. This style of hunting required a greater area of land for its practice, so Christian V increased the boundaries to include the fields up to the village of Stokkerup (the area known today as Eremitagesletten), as well as taking in the land that today is Jægersborg Hegn. The additional enclosure increased the size of the park to 16 km2 (6.2 sq mi). The inhabitants of Stokkerup, whose village pond still lies within Eremitagesletten area, were ordered to tear down their houses and make use of the materials to rebuild the farms in the area that had stood empty since the Northern Wars. They were compensated for this by having a period of three years during which they were exempt from taxation. Eremitagesletten is an area in the north of the park. Originally this area was the fields of the village of Stokkerup, but was enclosed when Christian needed it for hunting with dogs. 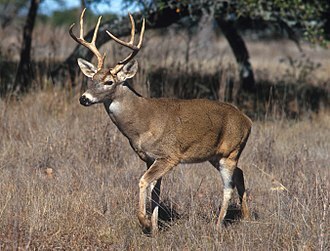 Evidence of this can be clearly seen from the roads which are laid out in the classic star form that was typical for areas used in this form of hunting. In the middle of Eremitagesletten is the Hermitage, built during the reign of Christian VI. 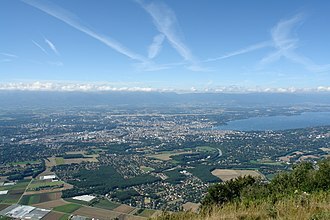 Eremitagesletten is encircled by forest. From Hjortekær to the north and the east there is a row of chestnut trees that make up the boundaries of the plain. 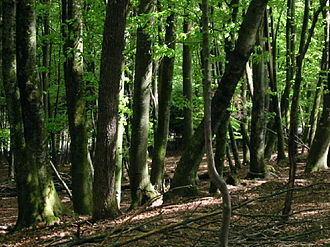 This row of trees marked the northern extent of Dyrehaven until 1913, when the boundaries were extended north of Mølleåen. This is an area north of Eremitagesletten near Rådvad along the banks of the Millstream. Fortunens Indelukke is an area in the west of Dyrehaven. 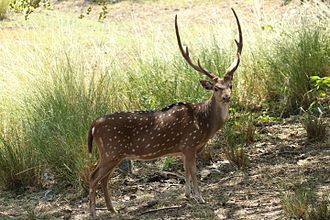 It is fenced in and is the only part of the forest that the deer do not have access to. There are a few other areas also fenced in, but only smaller and temporary to save the young trees. Ulvedalene with Djævlebakken in the background. The many tents and constructions are part of the theatre production. Ulvedalene has Dyrehaven's hilliest terrain, which was created during the last ice age. Djævlebakken, a popular sledging run is found in this part of the park. Ulvedalsteateret (Ulvedal theatre) gave performances for 39 years in Ulvedalene. The first time was in the summer of 1910 with Adam Gottlob Oehlenschläger's Hagbart and Signe. The idea originated from the actor Adam Poulsen and producer Henrik Cavling. The architect Jens Ferdinand Willumsen created spaces for about 4,000 sitting and 2,000 standing spectators, which made it possible to lower the ticket price to an accessible level. The theatre survived up to 1949, and after a break of almost 50 years, the tradition was revived by Birgitte Price with an arrangement of Johan Ludvig Heiberg's Elverhøj in 1996 in a production supported by the Royal Danish Theatre, Lyngby-Taarbæk Kommune and Kulturby'96. Since then there have been further performances, the latest, Thor, in June 2006. This is the southernmost part of Dyrehaven and the most visited. Dyrehavsbakken (colloquially Bakken and literally in English "The Deer Park's Hill") is the world's oldest existing amusement park. Kirsten Piil's Spring. The water is still potable. Kirsten Piils Kilde (Kirsten Piil's Spring) was discovered in 1583 by Kirsten Piil about whom little is known. Legend states Kirsten was a pious woman, who, through her devotion, gave the spring curative powers, which made it a place of pilgrimage for the sick who would come to drink the water. Peter Lieps Hus (Peter Liep's House) is now a well-known restaurant. It is named after Dyrehaven's first sharpshooter, Peter Liep. The house was originally called Kildehuset (Spring house) and is thought to have been to be built towards the end of the 18th century. In the 1860s a two-storey extension was added that gave the house a clumsy appearance. Peter Liep took over the building in 1888. In September 1915 the house burned to the ground, but it was reconstructed by 1916. In 1928 the house burned down again. It was rebuilt to a different design, basically as it can be seen today. After some years a pavilion and toilets were added. Visitor numbers consistently rose (the house had already achieved a good reputation as a restaurant by the end of the 19th century). In 1952 a fire again broke out in the house. The fire was extinguished before it did any major damage: a hole was burned in the thatched roof, but later the same day the extensions caught fire and burned down, and only the main farmhouse was able to be saved. The extensions were rebuilt in 1954 and a new pavilion added in 1960. All these buildings are today known under the collective name "Peter Lieps Hus", though the house is very different from the house Peter Liep lived in on the same spot. Fortunen (The Fortune) is a former ranger station on the King's hunting road to Dyrehaven, named after the Roman goddess of luck Fortuna. It is now home to a hotel and restaurant. The Hubertus Hunt is a cross country horse race which takes place every year on the first Sunday in November, marking the end of the hunting season. First held in 1900, the event attracts about 160 riders and up to 40,000 spectators. The race always begins at Peter Liep's House and involves a break at the Hermitage Lodge. The race route is 13 km long and involves a total of 35 obstacles. The winner receives the Hubertus chain. The Royal Danish Theatre produces an annual theatre production at Ulvedalene in Jægersborg Dyrehave. ^ "Sites in Denmark, France and Turkey inscribed on UNESCO's World Heritage List". unesco.org. UNESCO. 4 July 2015. Retrieved 17 July 2015. ^ "Mølleåen" (in Danish). Den Store Danske. Retrieved 5 December 2014. ^ "Hubertus Hunt" (in Danish). Cisit Denmark. Retrieved 21 July 2015. This article incorporates text translated from the corresponding Danish Wikipedia article as of 29 March 2007. Meulengracht-Madsen, Jens: "Dyrehavens gamle ege, deres alder og vækst", Naturens Verden, nr. 11-12/1999, vol. 82, side 2-21. Valdemar II, called Valdemar the Victorious or Valdemar the Conqueror, was the King of Denmark from 1202 until his death in 1241. The nickname Sejr is an invention and was not used during the Kings own lifetime. He was the son of King Valdemar I and Sophia Valadarsdattir, a daughter of Richeza of Poland. When Valdemars father died, young Valdemar was only twelve years old and he was named Duke of Southern Jutland, represented by the regent Bishop Valdemar Knudsen. Bishop Valdemar was a man and disguised his own ambitions as young Valdemars. 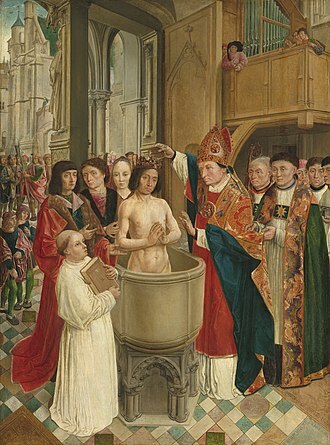 When in 1192 Bishop Valdemar was named Prince-Archbishop of Bremen, his plot to overthrow King Canute VI with the help of German nobility, Duke Valdemar realized the threat Bishop Valdemar presented. He invited the archbishop to meet him in Aabenraa in 1192, the bishop fled to Swedish Norway to avoid arrest. The following year Bishop Valdemar organised - supported by the Hohenstaufens - a fleet of 35 ships and harried the coasts of Denmark, in 1193 King Canute VI of Denmark captured him. Bishop Valdemar stayed in captivity in Nordborg and in the tower at Søborg Castle on Zealand until 1206, Bishop Valdemar was released upon the initiative of the Danish Queen Dagmar and Pope Innocent III and after swearing to never interfere again in Danish affairs. Young Valdemar faced another threat from Count Adolph of Rendsburg, Adolph tried to stir up other German counts to take southern Jutland from Denmark to assist Bishop Valdemars plot to take the throne. With the bishop in prison, Duke Valdemar went after Count Adolph and with his own troop levies march south and he defeated and captured the count in the Battle of Stellau in 1201 and sent him to sit in a cell next to Bishop Valdemar. Two years Duke Valdemar let Count Adolph buy his way out of due to an illness by ceding all of Schleswig north of the Elbe to Valdemar. In November 1202, Duke Valdemars elder brother, King Canute VI died unexpectedly at the age of 40, Duke Valdemar was subsequently proclaimed king at the Jutland Assembly. 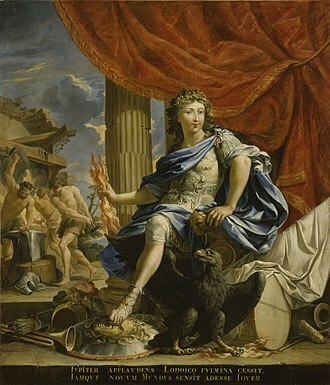 Fortuna was the goddess of fortune and personification of luck in Roman religion. She might bring good or bad luck, she could be represented as veiled and blind, as in modern depictions of Lady Justice, and came to represent lifes capriciousness. She was a goddess of fate, as Atrox Fortuna, she claimed the lives of the princeps Augustus grandsons Gaius and Lucius. Her father was said to be Jupiter and like him, she could be bountiful, as Annonaria she protected grain supplies. 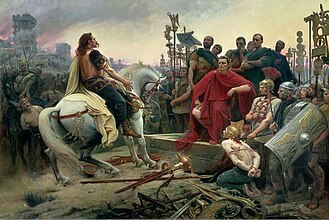 June 11 was sacred to her, on June 24 she was given cult at the festival of Fors Fortuna, fortunas Roman cult was variously attributed to Servius Tullius – whose exceptional good fortune suggested their sexual intimacy – and to Ancus Marcius. The two earliest temples mentioned in Roman Calendars were outside the city, on the bank of the Tiber. After undisclosed rituals they rowed back and inebriated, Fortuna had a temple at the Forum Boarium. Here Fortuna was twinned with the cult of Mater Matuta, and the temples have been revealed in the excavation beside the church of SantOmobono. Fortuna Primigenia of Praeneste was adopted by Romans at the end of 3rd century BC in an important cult of Fortuna Publica Populi Romani on the Quirinalis outside the Porta Collina, no temple at Rome, rivalled the magnificence of the Praenestine sanctuary. Fortunas identity as personification of chance events was closely tied to virtus, an oracle at the Temple of Fortuna Primigena in Praeneste used a form of divination in which a small boy picked out one of various futures that were written on oak rods. Cults to Fortuna in her many forms are attested throughout the Roman world, dedications have been found to Fortuna Dubia, Fortuna Brevis and Fortuna Mala. She is found in a variety of domestic and personal contexts, during the early Empire, an amulet from the House of Menander in Pompeii links her to the Egyptian goddess Isis, as Isis-Fortuna. She is functionally related to the god Bonus Eventus, who is represented as her counterpart. 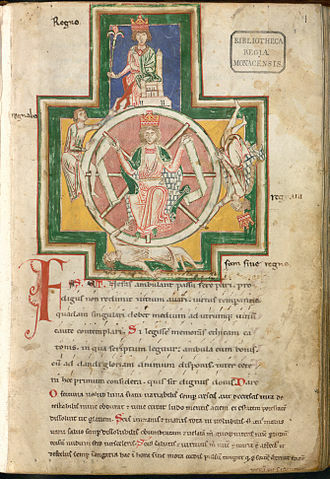 Her name seems to derive from Vortumna, the earliest reference to the Wheel of Fortune, emblematic of the endless changes in life between prosperity and disaster, is from 55 BC. The chestnut group is a genus of eight or nine species of deciduous trees and shrubs in the beech family Fagaceae, native to temperate regions of the Northern Hemisphere. The name refers to the edible nuts they produce, Chestnuts belong to the family Fagaceae, which includes oaks and beeches. Unrelated but externally similar species of horse chestnut are abundant around Europe, other trees commonly mistaken for chestnut trees are the chestnut oak and the American beech, both of which are in Fagaceae. The name chestnut is derived from an earlier English term chesten nut, the name Castanea is probably derived from the old name for the sweet chestnut, either in Latin or in Ancient Greek. Another possible source of the name is the town of Kastania in Thessaly, more probable, in the Mediterranean climate zone, chestnut trees are rarer in Greece because the chalky soil is not conducive to the trees growth. Kastania is located on one of the relatively few sedimentary or siliceous outcrops and they grow so abundantly there, their presence would have determined the places name. Still others take the name as coming from the Greek name of Sardis glans – Sardis being the capital of Lydia, Asia Minor, the name is cited twice in the King James Version of the Bible. In one instance, Jacob puts peeled twigs in the troughs to promote healthy offspring of his livestock. Although it may indicate another tree, it indicates the fruit was a staple food in the early 17th century. These synonyms are or have been in use, Fagus castanea, Sardian nut, Jupiters nut, husked nut, Chestnut trees are of moderate growth rate to fast-growing for American and European species. Their mature heights vary from the smallest species of chinkapins, often shrubby, to the giant of past American forests, C. dentata that could reach 60 m. Between these extremes are found the Japanese chestnut at 10 m average, followed by the Chinese chestnut at about 15 m, when standing on their own, they spread on the sides and develop broad, dense crowns at maturity. The two latters foliage has striking yellow autumn colouring and its bark is smooth when young, of a vinous maroon or red-brown colour for the American chestnut, grey for the European chestnut. The Hermitage Hunting Lodge is located in Dyrehaven north of Copenhagen, Denmark. The hunting lodge was built by architect Lauritz de Thurah in Baroque style from 1734 to 1736 for Christian VI of Denmark in order to host royal banquets during hunts in Dyrehaven. Never intended for residence, the Hermitage Hunting Lodge was built as a setting for hosting royal banquets during hunts in Dyrehaven, the apparatus was removed in the late 18th century as it was causing endless mechanical problems, and no signs of it remain. The previous castle on the site, the Hubertus chalet, had an apparatus and was nicknamed Heremitagen for the same reason. The area surrounding the building was fenced as Jægersborg Dyrehave on the initiative of Frederick III and this style of hunting involved having hounds run the prey tired and hold it down until a hunter would step off his horse and make the kill at little effort. The first hunting lodge on the site, the Hubertus chalet, was built by Hans van Steenwinckel III for Christian V and it was built during 1734 to 1736 during the reign of Christian VI at a total cost of about 18,000 rigsdaler. A planned renovation in 1786 was cancelled, as the estimated cost of 3,000 rigsdaler was considered too expensive, in 1790 the decision to tear the building down was made, but the decision was not very popular. In 1794, the project succeeded, and Rantzau began a renovation of the building at a cost of 4,000 rigsdaler and it did not take long for Rantzau to find its location inconvenient and remote. He decided to sell and by 1797 the hunting lodge was once again royal property, in 1798, the architect Johan Boye Junge Magens initiated yet another round of repairs, and in the process many of the exterior sculptures and decorations were removed. Magens was, as fashion dictated, eager to rid the building of the decorations that made it typical of its time, in the early 19th century, after the Treaty of Kiel, Frederick VI changed the use of Dyrehaven, the area was mainly used for military exercises. The lodge was still in use, but mainly for lunches for the king, when Christian VIII became king in 1839, the hunts resumed. 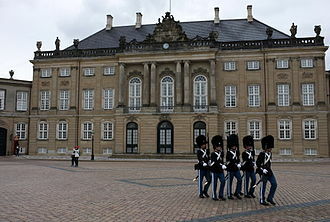 Additionally, the Hermitage became the centre of large, public gatherings, on 5 June 1849, king Frederik VII signed the fresh Danish constitution at the Hermitage at 11.15, ending absolute monarchy in Denmark. The Par force hunting landscape in North Zealand is a collection of hunting grounds and forests north of Copenhagen, inscribed on the UNESCO List of World Heritage Sites on 4 July 2015. The landscape comprises three areas, Store Dyrehave, Gribskov and Jægersborg Dyrehave/Jægersborg Hegn. The landscape was submitted for admission on 1 August 2010, the three forests are all located in the North Zealand peninsula to the north of Copenhagen. Jægersborg Dyrehave with the fenced Jægersborg Hegn is closest to the capital on the peninsulas east coast, the square-shaped Store Dyrehave is located further to the north in the centre of the peninsula while Gribskov, further north still, is adjacent to Esrum Sø. In connection with the Danish Reformation, in 1536 King Frederick II confiscated the estates belonging to the Catholic Church, from 1560, the various estates were merged in order to establish an extensive royal hunting park across the North Zealand peninsula. It was however King Christian V who from 1670 put his army to work on creating a par force deer park around Ibstrup Castle, in his youth, the king had experienced par force hunting in Frances forest of Saint-Germain-en-Laye. He now imported hounds and huntsmen from England, renaming the castle Jægersborg, one of the most important aspects of the par force hunt was that it provided a basis for demonstrating the absolute power of the monarch by developing connecting roads across the landscape. The entire North Zealand peninsula area was patterned with a Cartesian-based road system consisting of stars surrounded by distinct squares, stone posts indicated whether roads led towards or away from the centre of the star. 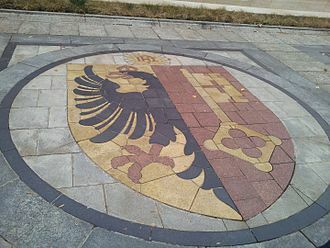 The mathematical approach reinforded the kings image as a representative of reason in line with Baroque ideals, the Danish orthogonal geometry of the road systems was an improvement on the star-shaped grids used in France and Germany as it provided equal access to all parts of the forest. The Jægersborg hunting park contained no star-shaped road networks but was based on the presence of a royal hunting lodge. In 1736, it was rebuilt in Baroque style as Ermitageslottet or the Hermitage Hunting Lodge, the museum is expected to be the site manager and principal coordinator of information and news about the Par Force heritage site. The Hermitage seen from east Photochrom prints--Color--1890-1900. Plaque on their home in Christianshavn.